Let’s start with Happy Spring everyone! Here’s what we woke up to this morning! I must say, rather annoying! It rainy/icy/slushed Friday afternoon, then by the evening, it began snowing. When I went to bed, there was already a few inches on the ground. It was windy all night, so it’s hard to tell how much snow fell. About 8 inches at our doorstep, which always seems to pile up. Some places of the driveway had a good inch of slush under the snow, it’s was heavy and a great workout for me. It has been snowing all day. Good thing is, it hasn’t stuck to the driveway much, yet. It’s still snowing late into Saturday night. Sigh! And I think it’s supposed to be in the 60’s by Monday. The good thing is we were in Utah, saw on the news that the storm was coming, decided to leave a day early and drove straight through (21 hours!---ahhh!) We usually stay a night in Denver, but knew if we did that the storm would be in Wyoming and Colorado and we could get stuck there. We left Thursday at 4 a.m. and got home just before 1 a.m. the next day. Sigh. Poor little Sammie was not a happy camper. He kept crying, “I want to walk,” as he’d struggle in his car seat. We persevered and are glad we got home before the snow! Before we left, Sam got a few more birthday presents. While we were in Utah, we had a Smith gathering with lots of family. It was Emilee’s birthday (one of Kevin’s nieces) on the 15th and Sam’s on the 16th, so we had a yummy dinner that Cindy prepared and I made cake. The paws are made with some devil’s food cookies, and Junior Caramels. I thought they were pretty cute. The kids all devoured these. There were ump-teen kids there. For the adults and whoever else didn’t want cupcakes, I made my Divine Carrot Cake. I doubled the recipe and baked it in a 9x13 pan. I left out the coconut, because some people don’t like coconut (whatever! ;)) I used pecans instead of walnuts. I made cream cheese frosting to go with it, which is also what I frosted the cupcakes with. 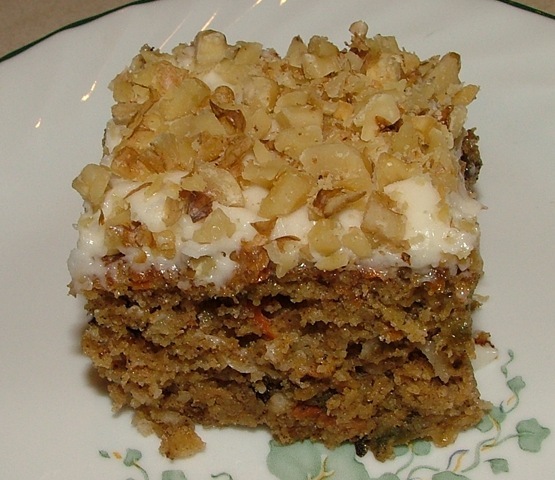 The carrot cake is so good and moist and flavorful. I used white whole wheat flour, so it was healthy! ahem. And I think I did a not-too-shabby job with the lettering, which is not one of my strong points. At least I don’t think this would be Cake Wrecks worthy! This photo of the carrot cake is from my original post. If you like carrot cake, this is certainly one to try. I’ve even made cupcakes with it and you could do two 8-inch round cakes and layer it. I fried an egg for Taylor for breakfast one morning while we were in Utah. I know double yolks are pretty common, but have you ever seen a quadruple? While in Utah, staying at Kevin’s sister Cindy’s (Thanks for letting us stay with you Clydes! ), I wanted to make them some of the New York Times chocolate chip cookies that I love so much, I even bought some cake flour and bread flour and good chocolate chips. Then I got back to their house and realized they only had margarine! What to do? So just to experiment and see what would happen, I made half a batch with the margarine. Sift flours, baking soda, baking powder and salt into a bowl with a wire whisk. Set aside. In bowl of electric mixer, cream together butter and sugars until very light, about five minutes. Add eggs, one at a time, mixing well after each addition. Stir in the vanilla. With mixer on low, add dry ingredients and mix just until combined. Stir in chocolate with rubber spatula. Optional--Put dough in a plastic container and refrigerate for at least a couple hours, but ideally 24 to 36 hours! (You think it won’t make a difference, but it’s really good! Although, I often only chill for a couple hours and these are still excellent cookies. When ready to bake, preheat oven to 350 degrees. Line baking sheets with parchment paper and scoop dough into balls on sheet. Bake 9-15 minutes depending on size. ½ ounce cookies baked 9 minutes. Regular sized cookies are about 1 ½ ounces and baked 11-13 minutes. (Made 9 ½ dozen ½ ounce cookies!) 2-3 oz. cookies are huge and delicious and more like NYT. Eagle Mountain, Utah. Our new house is one of those out there in the distance. You can see it from Cindy’s house where the picture was taken. For Sam’s birthday, we went to the SLC Hogle Zoo. It was a perfect day. But for some reason that morning, Sam was walking with a limp and said his leg hurt. We think he must have got up in the night and fallen in the room we were sleeping in. So he had to sit in a stroller through the whole zoo. He hobbled around a bit for a couple days, but is fine now. My almost-12-year-old monkey refuses to be on camera! How cute is this baby elephant?! The baby is already 7 feet tall! And now just a few more random photos. I made pancakes for breakfast yesterday. Parker LOVES to play with his food, sometimes he’s still messing around with it after everyone else is done eating. But he was pretty proud of his Picachu from Pokemon. Taylor and Sam were playing with a box of diapers yesterday. Hey, when you’ve packed most of the toys, you gotta make due, right! And this morning, Sam came in our room while we were still asleep (he often does! ), but I let him climb in bed with us about 7:45. We got up shortly after that, and Sam slept all comfy in our bed until after 11 a.m.! Ahh, how would that be? Eagle Mtn huh? Other end of the valley darn it. We still have to get together when you get here :) Happy birthday to Sam! Your kids are the cutest things in the whole world! The diapers - that's too funny. Utah looks beautiful. I'm incredibly jealous. Your house looks lovely as well. I want some of those cookies. They look amazing! WOW snow?!?! That is crazy! We are almost in the 80's in Vegas. I couldn't imagine snow right now. haha. Really enjoyed this post. As an artist, I find Utah to be one of the most beautiful states in the country. Looks like your home at the mountain will be a great place for the kids (and grown ups too). Love the NY Times cookie! I need to make these again soon too, as well as get back to NYC for another cookie tour. I hear there are more bakeries/cookies in the running now, the competition has gotten really fierce. yuck to snow, yum to desserts! That is a lot of snow! Those cookies look perfect! The paw print cupcakes are so cute! That's funny about the margarine - when I was growing up, that's all we had and it was always fine. Now I freak out if I don't have unsalted butter. Ha! I can't imagine 21 hrs straight with the kids. We just got home from a 6 hr road trip to Las Vegas and we only had one of our kids with us. Hope that Sam is better, he looks like such a King in that stroller. Love the house. Such adorable pictures!! :) Looks like you all had a great itme, though that drive couldn't have been good!! Sam is the cutest!! Happy birthday to him! That carrot cake really does sound divine! I love the baby animals and the paw cupcakes! Fun pictures, thanks for sharing! Too fun Katrina - 21 hours? You're a saint! St. Katrina.... what a great post - your boys are so lucky to have you (baking) and for their mother! Love the carrot cake! He is so adorable! I could never sit in the car for 21 hours so I think Sam is a trooper. Those NYT CCC look pretty fantastic! LOVE the new house, just gorgeous. Such cute photos of the kiddos...such fun to see. Thanks for sharing, much happiness for you all in Utah!